Established manufacturer, Glasdon, have unveiled their latest move ahead of the company’s 60th Anniversary year. For the standing ovation that you all deserve, take a look at these tips and ideas to put the crowd-pleasers and feel-good factor into all aspects of your visitor experience. Two playgrounds in Taiwan were looking for children’s seating to fit in with their unique, imaginative themes, and it was our novelty shaped seating solution which offered inspiration, along with a place to sit. We are proud to have become part of the #DriveDownLitter movement by providing Hubbub with a selection of eye-catching Combo Delta Litter Bins. Here at Glasdon International we're all more than a little jealous of the Sherwood Litter Bin. Koç University, one of the most prestigious universities in Turkey contacted the Glasdon International team looking for a solution to help manage litter and cigarette litter. The University selected the elegant Glasdon Jubilee™ 110 complete with gold, hood mounted ashtrays to complement their impressive University grounds. Glasdon have launched a new addition to the popular Glasdon Jubilee™ litter bin range. A solution designed to meet some of the on-street waste management challenges faced by local authorities and operators today. Today’s design brief for any modern communal facility will undoubtedly feature designated space for waste and recycling containers or multi-stream stations. 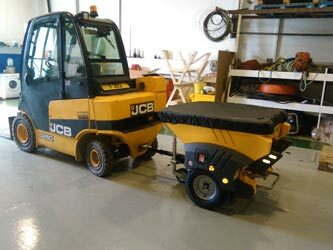 However you may wish to consider an integrated solution to waste management. Ishida Co Ltd is a world leader in the manufacture of weighing and packaging equipment, mainly centred on the food industry. The business was founded in Japan in 1893 and is still owned and operated by the Ishida family. 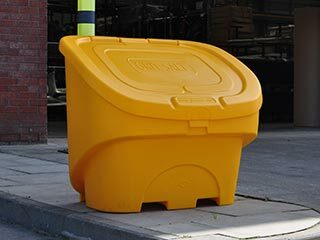 Glasdon are proud to sell our Neopolitan litter bins to Ikea in their signature yellow colour. The Falklands are divided up into 778 islands and islets in the South Atlantic Ocean. Its geographical position makes it a perfect habitat for an array of natural life. For a small island, it has a well-established culture and is steeped with historical value. Although remote, the Falklands are both self-sufficient and well connected to the outside world. The historic city of Poquoson, Virginia USA traces its roots to an English colony founded in 1631, and is one of few places in the state to retain its original Powhatan name. Poquoson's Parks & Recreation department contacted Glasdon looking for new litter bins for playgrounds in the city. Splash™ Litter Bins have a 85 litre capacity and encourage young children to deposit their litter in the right place. Reducing your environmental impact is a vital aspect of corporate social responsibility. While this covers everything from energy efficient buildings to low emissions travel, recycling plays a considerable part in the eco-friendliness of a business. Deutsche Bank have accepted these responsibilities. Onondaga Lake near Syracuse in central New York, USA, is sacred to the Onondaga Nation and traditionally regarded as the birthplace of the Haudenosaunee, also known as the Iroquois Confederacy. Aquarium Barcelona is located in Port Vell harbour in the beautiful city of Barcelona. The 35 aquarium tanks in the facility house 11,000 animals from 450 species. Hoffler Creek is a beautiful 142 acre wildlife reserve sitting at the mouth of the James River in Virginia, USA offering environmental education, research and recreation, which is carried out through various activities such as Hiking, Kayaking, Oyster Gardening and through the beautiful docks and overlooks. World leader in aerospace equipment and systems for commercial, regional and business aircraft, chooses Glasdon recycling bins to achieve their corporate recycling goals. Perth Airport is the fourth largest airport in Australia in terms of passenger traffic. Increasing traffic year on year has led to a larger amount of waste being sent to landfill. As part of a wider sustainability strategy, Perth airport have been working to integrate recycling into all aspects of their business. Tourism is one of the major industries in Israel. As the home of Jerusalem, a holy city to the three major Abrahamic religions - Judaism, Christianity, and Islam - the country has an abundance of attractions for historical, religious, archaeological and heritage tourism. Returpack is responsible for the deposit system on metal cans and PET bottles for beverages in Sweden. The privately-owned company manages the finances of the scheme and organises the return of containers for recycling. The Swedish Environmental Protection Agency set tough targets of a 90% recycling rate for cans and bottles - the target was achieved for aluminium cans in 2010. Named after the 1st president of UAE, the Sheikh Zayed Grand Mosque in Abu Dhabi is a stunning architectural work of art and one of the world's largest mosques. With an ambitious vision and the high expectations of the landmark to be a majestic masterpiece, every artistic design element was carefully considered. Built in 1656 and previously serving as a gunpowder factory and a lunatic asylum, Pitié-Salpêtrière Hospital in France is one of the most celebrated medical facilities in the world. Doctors including Sigmund Freud, Georges Gilles de la Tourette and Maria Montessori practised medicine at Pitié-Salpêtrière, and famous patients have included Jacques Chirac and Gerard Depardieu. When British soapmaker Lever Brothers merged operations with Dutch margarine producer Margarine Unie in 1929, the management of the new company could not have imagined its future. Through expansion and further mergers, Unilever is now one of the largest companies in the world. Hendaye is a popular seaside tourist resort in French Basque Country, located on the Atlantic coast and the banks of the Bidassoa. The town is famed for its watersports, with a successful rowing club, a popular surfing beach, and a large marina with 850 berths. The 2014 International Ice Hockey Federation (IIHF) World Championships were held in Minsk, the capital of Belarus, from 9-25 May. In just thirty years, Actavis plc has grown from a small research laboratory into one of the world's largest pharmaceutical manufacturers, with revenues in excess of $8 billion. The ancient city of Cologne is the fourth largest in Germany and dates back to the Roman colonisation in the first century AD. Pulkovo Airport is in St. Petersburg and is managed by the Northern Capital Gateway. This has become one of the first airports in Russia whose goals are to help reduce the negative effect of waste to landfill. With the help of our International partner in Iceland, the streets of Reykjavik the capital city have an unrivalled reputation for the very best standards of street cleanliness. Making headline news in the prestigious Morgunbladid national newspaper, an order for personalised Standford bins is said to be significantly improving the local environment. As part of our commitment to customer satisfaction, as well as our responsibilities as an ISO9001:2008 certified company, we at Glasdon regularly survey a sample of our customers to ensure we live up to our own high standards. A robust, low-maintenance litter bin with an attractive rustic appearance that makes it perfect for rural locations, parks and open spaces. The verdict is in: Glasdon customer service is exceptional! The new Topsy Royale™ is a traditionally styled litter bin which features a domed hood and chamfered apertures to help prevent littering.